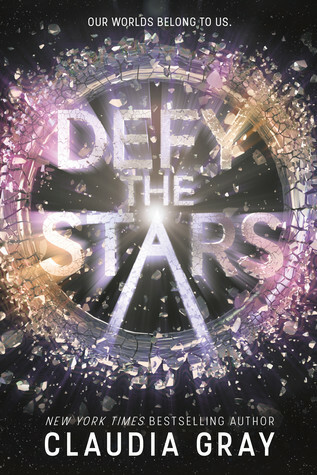 Good Choice Reading: Review & Giveaway: #DefyTheStars by Claudia Gray + $25 Gift Card! Review & Giveaway: #DefyTheStars by Claudia Gray + $25 Gift Card! "Sometimes she wishes she could turn herself inside out. That way people would see the good in her before they saw the bad." Defy the Stars was a lot of fun! It didn’t blow me away, but I did enjoy it. Defy the Stars is written in alternating perspectives. Claudia Gray does a good job of creating characters that are realistic for both their circumstances and their ages. Though this is YA, neither of the main characters are your typical teenager, and they both have responsibilities that you obviously aren’t going to find in reality. However, she does a good job of capturing the youthfulness of their ages, and balancing that with their motivations, which are dictated by their circumstances. I enjoyed both of their perspectives, and enjoyed watching them grow as characters. Though the world-building and story didn’t absolutely blow me away, I did enjoy following these character from one planet and culture to another. Noemi and Abel are on a mission, while also running for their lives, and this made for a lot of juicy tension. I enjoyed the start to this new series by Ms. Gray, and I look forward to seeing where else it takes us. Comment below and let us know what YA Sci-Fi novels you would recommend we pick up! Be sure to leave a way for us to contact you! If you're uncomfortable leaving your email, let us know where we can find you on Twitter!